To many, Igor Akinfeev will already be a household name. However, the CSKA Moscow can certainly get even better as he looks set to make a move away from Russia at some stage in the near future. Chelsea, Inter Milan and Lyon have all been linked with the Russian number 1. Akinfeev is still only 22 years old, and has already played over four years of first-team action for CSKA Moscow in the Russian top flight. Akinfeev has enjoyed regular success with the Russians, and even helped guide the side to UEFA Cup glory this year after defeating Rangers in the final. Prior to Euro 2008, Akinfeev nearly had 20 caps for Russia and Guus Hiddink has decided to make Akinfeev his number 1, despite a host of other very good goalkeepers playing in the province. It seems that many sides are keen to land the Russian goalkeeper now as they are aware that the player probably has another 15 years of top flight football to provide. 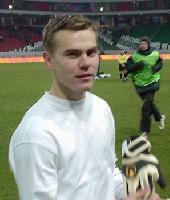 Akinfeev impressed in the 2007/2008 Champions League, where he went a whole 362 minutes before conceding a goal. What is most impressive about Akinfeev is the fact he has enormous potential and has the ability to become the best goalkeeper in the world. Akinfeev has brilliant reflexes and his shot stopping abilities are fast improving. Akinfeev won't come on the cheap though, if CSKA decide to sell him. It is understood that the Russian could command a transfer fee of around Â£10 million for the goalkeeper already.